Lifeclinic will be featuring the LC500 Health Station in support of the Novartis and IAFF STOP•DROP•CONTROL high blood pressure awareness and community health outreach campaign at the IAFF 10th Biennial Dominick F. Barbera EMS Conference. Lifeclinic International, Inc., the world's leading manufacturer and distributor of automated blood pressure monitors and health testing stations, will exhibit its LC500 Health Station with Novartis Pharmaceuticals Corporation at the International Association of Fire Fighters (IAFF) 10th Biennial Dominick F. Barbera EMS Conference. The Conference will be held at the Fontainebleau Miami Beach Hotel in Miami, Florida, June 7 - 10. Lifeclinic will be located at Novartis booth #8. Lifeclinic will be featuring the LC500 Health Station in support of the Novartis and IAFF STOP•DROP•CONTROL high blood pressure awareness and community health outreach campaign. To date, the program has provided hundreds of IAFF affiliates with the materials and resources to conduct blood pressure screening and educational activities for IAFF members and their communities. "Lifeclinic is pleased to be supporting Novartis and the IAFF in this campaign," said Steve Halperin, Lifeclinic's Chief Marketing Officer. Halperin added, "For years, firehouses across the nation have acted as a base of outreach; in many communities their doors are open for those who want to have their blood pressure measured. We see our health stations as a valuable asset and tool for IAFF members in meeting the ever increasing technological demands required in today's biometric testing environment. Because of programs like STOP•DROP•CONTROL, people now understand that hypertension can be just one of several diseases a person may have that need to be monitored and managed." In addition to citizens in the communities that IAFF members serve, the program also strives to help maintain the health, wellness and safety of its members. As Harold A. Schaitberger, General President of the IAFF, says on the organization's Web site, "Improving fire fighter health, wellness, fitness, safety and performance is perhaps the single most important goal the IAFF strives for every day. Keeping our members healthy and safe ultimately helps improve their effectiveness in meeting the needs of their communities." Lifeclinic's LC500 can contribute to achieving that goal. Featured at the Novartis booth will be the LC500 -- a community-friendly health station that offers automated blood pressure, weight, body fat, BMI and blood oxygen tests, along with glucose meter upload capability. IR (infrared) and USB peripheral input ports permit interfacing with various personal health devices including pedometers. Users can easily navigate through the LC500's interface of test options and health information via a 10.4" color LCD touch screen. The LC500 is Internet-ready for secure, HIPAA-compliant, open source integration into most network environments and can easily communicate with other wellness applications so that all data gathered by it can be saved. The LC500, along with Lifeclinic's Web-based GroupStat management system, can collect, track and manage real-time biometric data, for individuals or in the aggregate, to improve the overall outcome of community health programs. Users can also manage their own data from any Web browser via Lifeclinic.com or an independent Web site or health portal. Other features include a barcode reader and an optional magnetic stripe reader for member identification badges and cards. 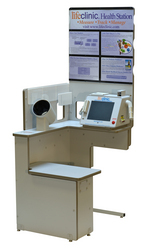 Lifeclinic is the world's largest supplier of commercial, automated, blood pressure monitors and health stations. Lifeclinic monitors can be found in over 30,000 pharmacies and 5,000 worksites, wellness centers, medical clinics and health clubs worldwide, performing 500 million blood pressure measurements annually. Lifeclinic monitors, health stations and management systems encourage individuals to take an active role in their healthcare and provide corporate management with tools to help reduce costs while improving the health of individual employees.